For the first time in a very long time, I am so happy with my hair! The past couple years it’s been through a lot! 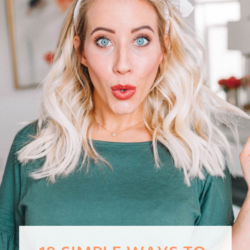 I lost so much of it after having the twins and then I had to figure out ways to hide all that re-growth… you remember the re-growth yes?!! It was nuts. I was also bleaching it too much and just generally not taking care of it like I should. It was dry and more unhealthy than it’d been in a long while and so I decided I needed to make some serious changes. I started by bleaching it less, added in more low lights and fell in love with the sombre look. It was just the change I needed. I refrained from using heat when I could and I upped my product game in a big way! 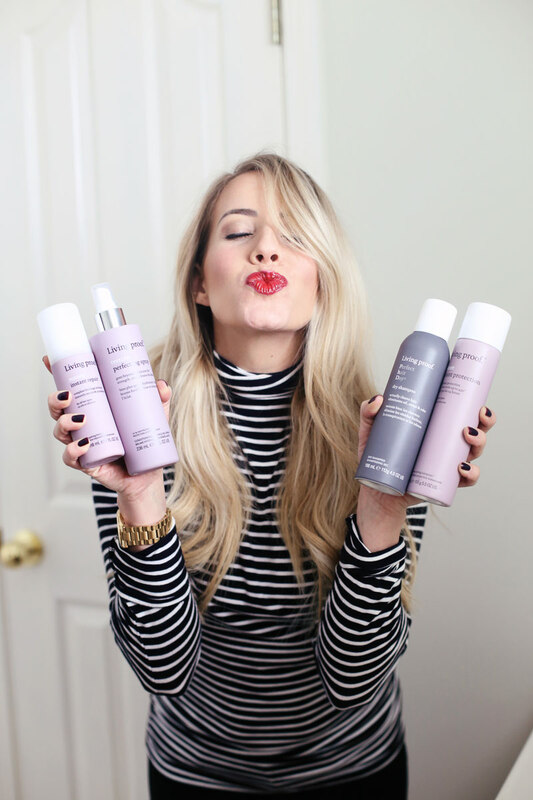 So, I’m here to share a few of my favorite products and tricks on how I managed to totally transform my hair. I hope you enjoy! 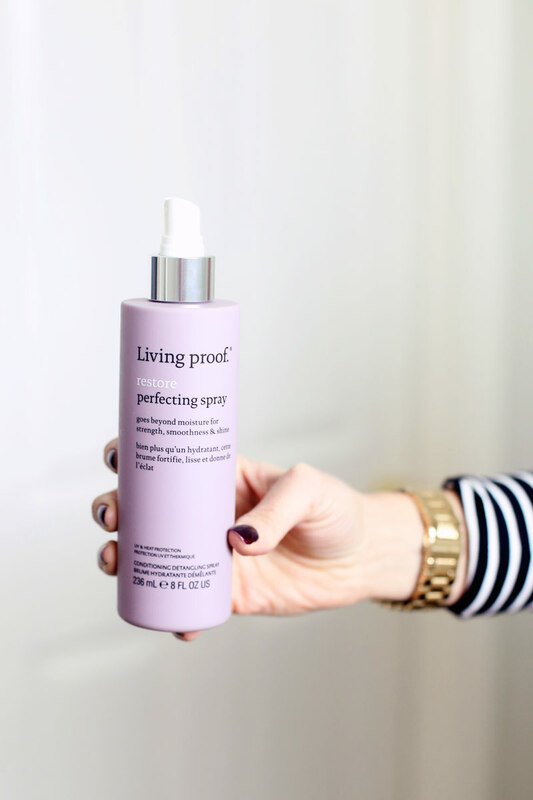 My obsession for the Living Proof products is not a new one – I’ve been singing its praises for well over a year now. One of my absolute favorite products, aside from their Dry Shampoo of course, is their brand new Restore Perfecting Spray from their Restore line. I’ve been testing it out for a while now and guys, it is a GAME CHANGER!!! 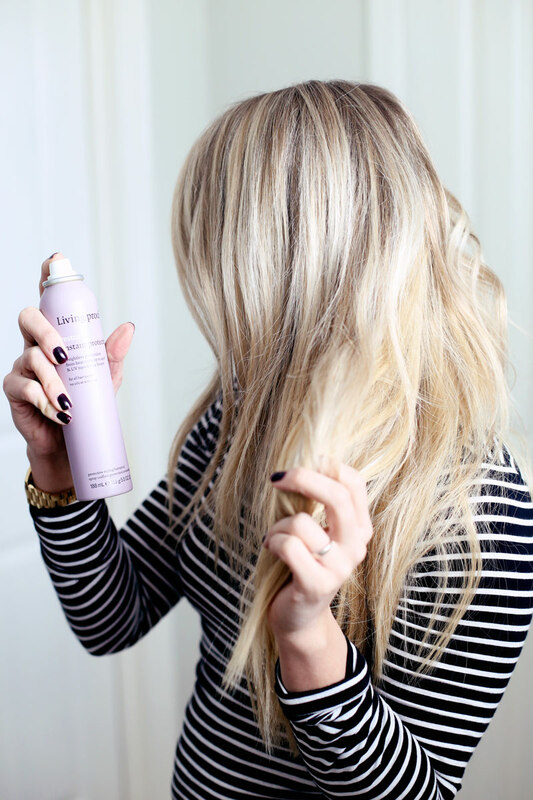 Mist the Restore Perfecting Spray all over damp hair and watch as it effortlessly detangles and softens the hair! It gives your hair a boost of hydration, adds smoothness, natural shine and it even has a time-released conditioner, which keeps the hair looking and feeling so dang soft throughout the day! Or the next and the next… until you finally wash it again. I really love when a brand backs me up on the whole washing less is more thing! Okay sorry, I digress. Not only does it protect during detangling, but it also protects against heat damage which is always a bonus and gives my hair an added boost of strength. 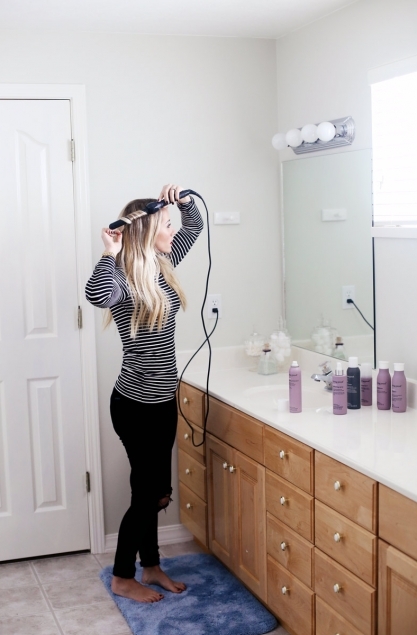 After the Restore Perfecting Spray has been distributed evenly throughout the hair, I like to add the Restore Instant Repair before I blow it dry. 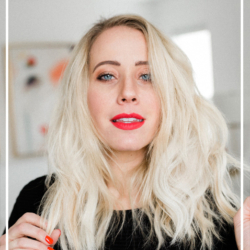 This product is infused with silk proteins so it makes the hair soft and strong, protects it against the damaging effects of UV rays, and it’s perfect for damaged hair — blondes, I’m talking to you!! If you’re a blonde, you need something that has some protein in it. Something that’ll mend those broken strands from all the stress of the bleaching process. This product can be used on damp and dry hair, so anytime I feel like it needs a little bit of moisture, maybe my ends are becoming just a tiny bit frizzy, I rub a small amount into the ends and it just calms them down and makes them feel so soft! Next up is the Restore Instant Protection. It’s a weightless spray that adds shine while protecting against static, heat and UV-damage. It’s super lightweight, layers awesome with other products and can be used on wet or damp hair! When I’m sectioning my hair up to curl it, I just mist a little bit over each section before applying heat. 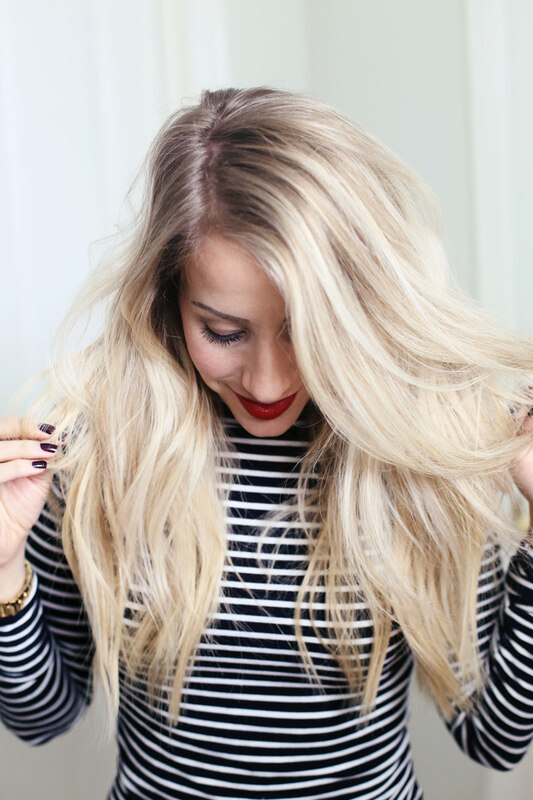 And to get those really loose waves? 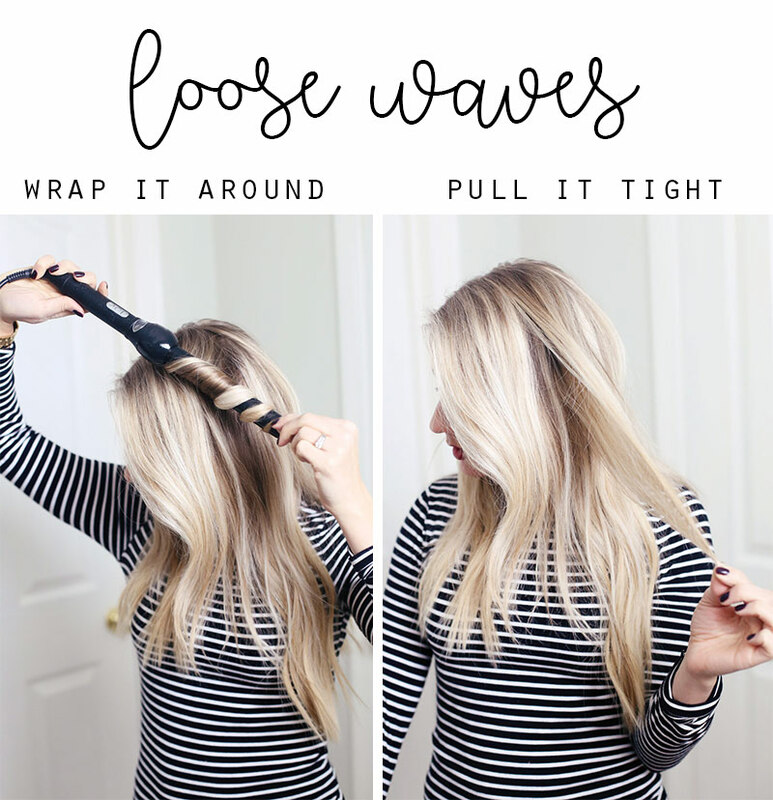 Wrap a section around a 1″ wand and then pull it tight to loosen up the curl! It’s as easy as that! I like the 1″ size because it holds the curl longer which means I don’t have to apply heat to my hair for a few days!! If you like those looser waves but you always loose the bounce by the end of the day, give the 1″ wand a try. 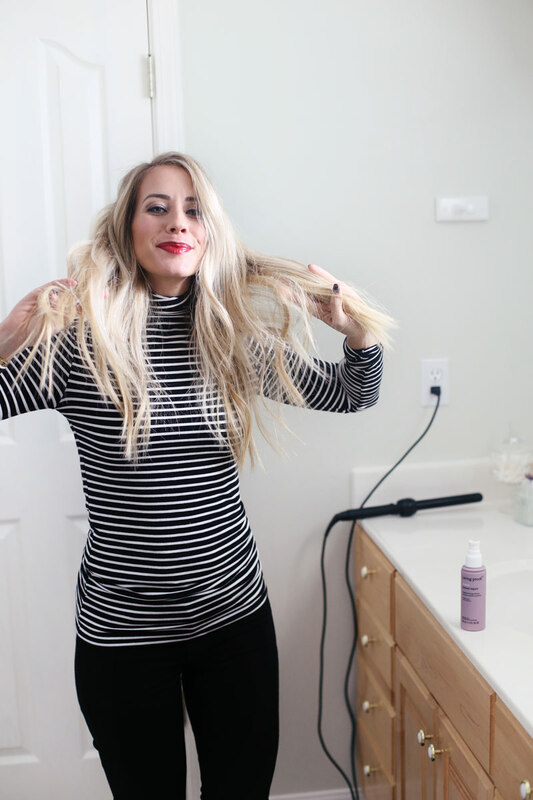 If you’re struggling with damaged hair, I cannot say enough good things about Living Proof’s Restore line and especially their new Restore Perfecting Spray. Your hair is most vulnerable when wet, so don’t forget to treat it before styling!!! What are some things you’re doing to keep your tresses healthy? 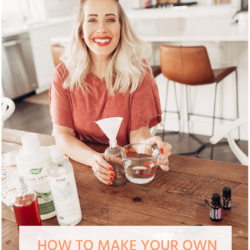 Any favorite products or home hacks? Have you tried the Living Proof Dry Shampoo yet? 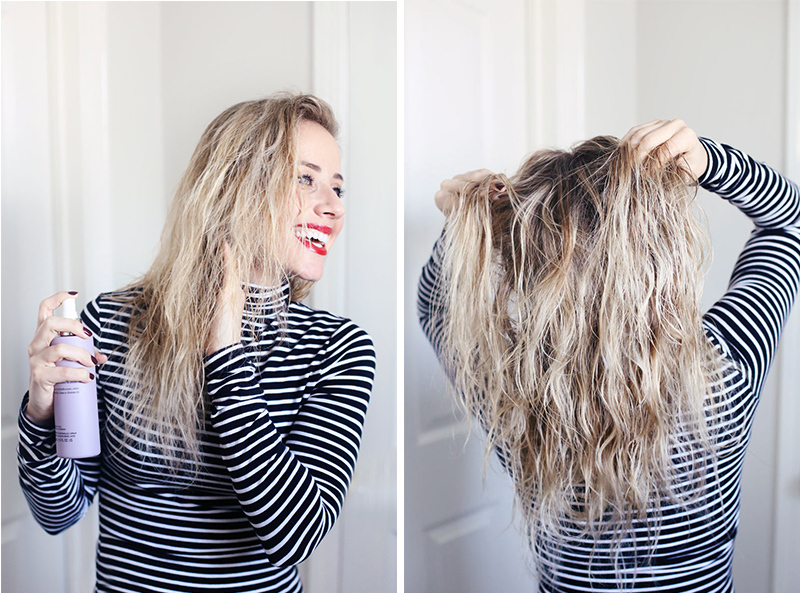 I also attribute my healthy hair to washing it only a couple times a week… less styling = so much less damage! Let me know if you want a post on how I went from washing every day to only once or a twice a week! Mmk, that’s all I have for you today! 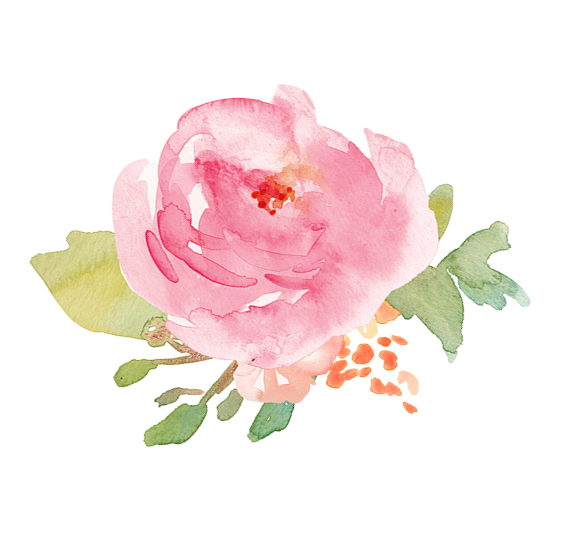 Go snag some of that Perfecting Spray — I promise you will absolutely not regret it! 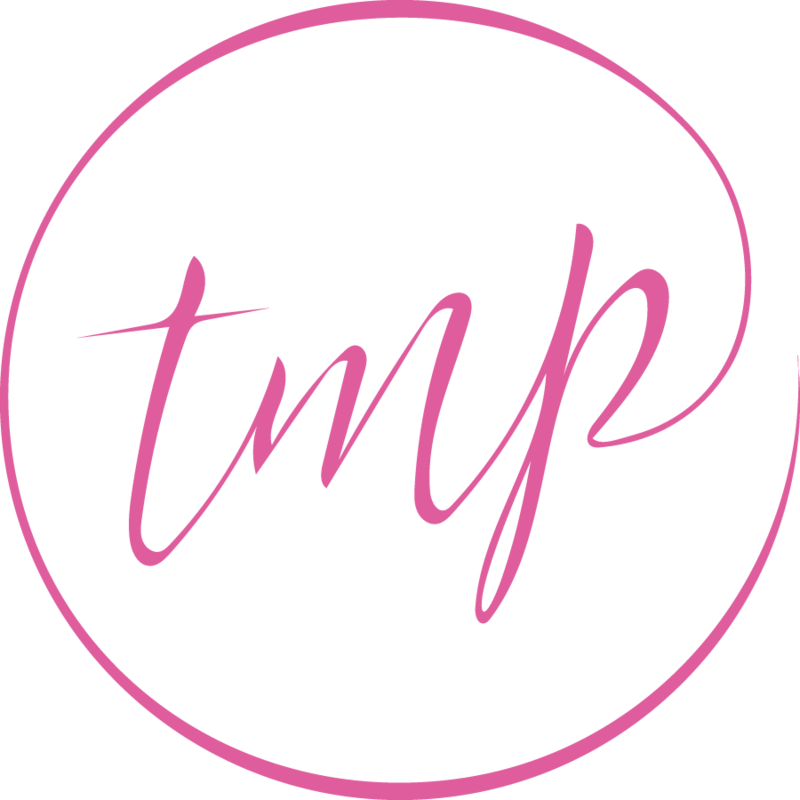 This post was made in collaboration with Living Proof, but as always ALL thoughts and opinions are my own and I only work with brands that I truly love.